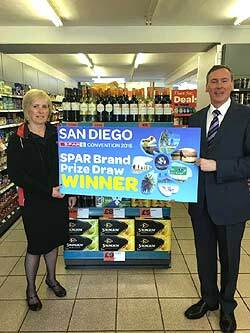 SPAR Scotland is very excited to announce the winner of the fantastic £4,000 San Diego Convention trip. The prize includes two return flights and a six day stay in beautiful hotel which is situated on a private peninsula between the Pacific Ocean and Coronado Bay. The lucky winners of this amazing prize were Susan Macleod and her son James Macleod, who are both absolutely delighted to win this experience of a lifetime.